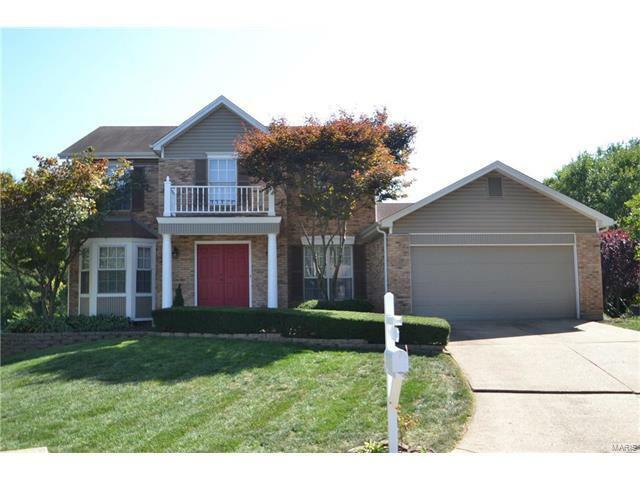 Beautiful and very well maintained 2 Story home located on a premium cul-de-sac lot in Remington Oaks subdivision in AAA Rockwood School District. This immaculate 5 bedroom total home provides lots of living space including a finished walk out lower level with a large rec room, full bathroom and 2 additional bedrooms. 2 story entry foyer is open on either side to formal living and dining rooms and leads to the large main floor family room w/bay window and wood burning fireplace w/built-in bookcases on either side, and is open the breakfast room & kitchen areas, along with main floor laundry. The upper level provides 3 generous size bedrooms with the master suite having vaulted ceilings, walk-in closet and luxury bath w/dual vanities, separate tub & shower. The finished walk out lower level has a large rec room, 2 extra bedrooms, full bathroom and storage areas. Enjoy the private backyard setting from the deck or covered patio. Subd pool, tennis courts, fishing pond & clubhouse. Hawkins Road west of Highway 141 to left on Newport Landing to right on Oakglen to right on Oak Terrace Court to house at end of cul-de-sac.